Torque Trends, Inc. (TTI) just finished a very successful pilot project for the City of Surprise, AZ. We started with a 2013 Ford F-150 SuperCrew Cab pick up truck sporting a 5.0 liter gas powered v8. We converted it to a 135 kW, plug in, battery powered zero emission vehicle. Torque Trends, Inc. (TTI) with CTO David Deckert is smack in the middle of a pilot project with the City of Surprise, AZ. They are electrifying one of the cities service vehicles, a Ford F-150 SuperCrew Cab pick up truck. This conversion creates a zero emissions vehicle that could enjoy upwards of a 20% ROI and be an economically viable service vehicle for three to five years longer than a typical gas powered truck. TTI believes that until the major automakers offer a zero emissions fleet vehicle, and for some years after, that conversion of existing vehicles will become quite popular. The City of Surprise agrees and based on the success of this pilot, plan to convert numerous vehicles over to electric. And the City of Surprise is not alone. Several utilities and other municipalities are closely watching the Surprise Pilot Progress as TTI gears up to supply mechanic friendly “bolt-on/plug and play” conversion packages for North America’s number one selling vehicle, the Ford F-150. Shock me once – shame on you, shock me twice – shame on me! Jokingly I use to say that “all I know about electricity is that it can be a shocking experience” then I got shocked! Now days, and primarily thanks to my friend Ben Smith, I know a bit more about this to be respected energy phenomena. Electricity is measured in terms of amperage, voltage, and wattage. Amperage (amps for short) is a measure of the AMOUNT of electricity used. Voltage (volts) measures the pressure, or FORCE, of electricity. The amps multiplied by the volts gives you the wattage (watts), a measure of the WORK that electricity does per second. Think of it this way: Electricity flowing through a wire is like water flowing through a garden hose. The amount of water in the hose equals the amps. The pressure of the water is the volts. The amount of work that can be done (watts) depends on both the amount and the pressure of the water (volts x amps = watts). In the e-Miata we use 100 individual 60 amp cells in series, they have a nominal voltage of 3.6 volts each. 100 x 3.6v = 360v x 60a = 21600 watts of energy or 21.6 thousand (kilo) watt hours expressed as 21.6 kWh. While that is enough energy to propel the e-Miata over 100 miles on a good day…it is also enough pressure and amperage to kill even Super Man. 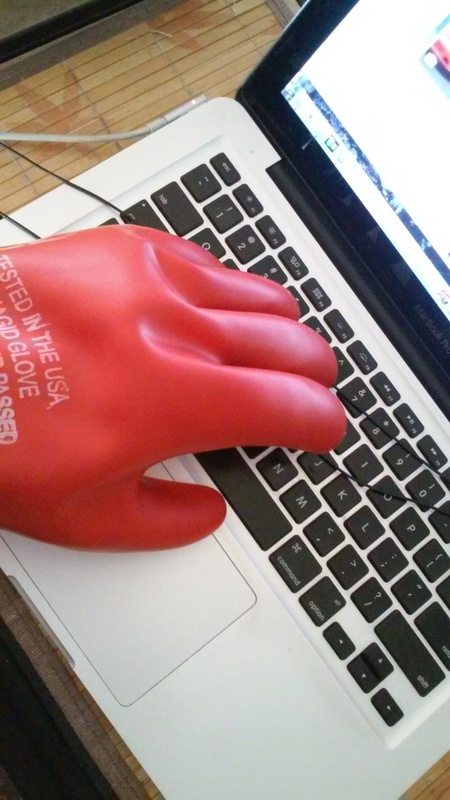 Thus, I freely and eagerly gave up $80 dollars for the red gloves in the photo, and no they are not needed for operating the lap top, even though it is a high powered Mac Book Pro! Brute strength comes from superior design and choosing the right materials and components. This is the tail housing. 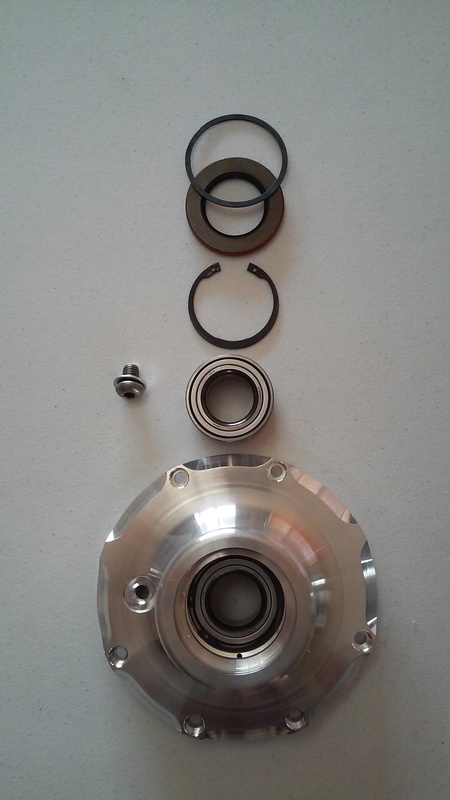 It incorporates the fill plug, the output shaft bearing, and a rear seal. Made from 6061 T6 aluminum it is the final housing of this brute strength unit. The bearing is a double row deep groove ball type. Typically designed for supporting one fourth of a vehicles weight, used here it is extremely heavy duty and should give years of service. 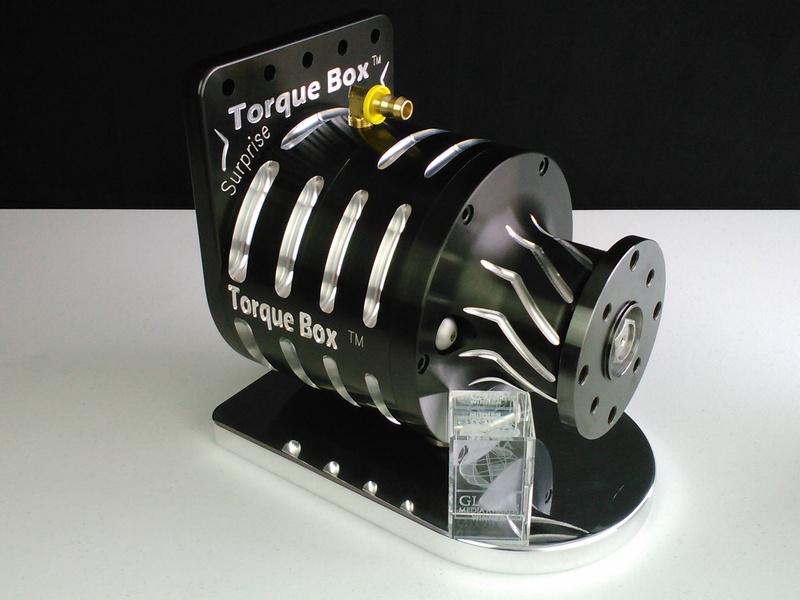 If you want the toughest EV Transmission on planet earth…you want an e-Torque Box. This is the EV Transmission (reduction gearbox) used in the e-Miata. This anodized Torque Box won an International Media Award at the SEMA Show. This is the carrier housing of the e-Torque Box. It incorporates the held planetary sun gear, two alignment pins for mounting the tail housing, a drain plug and the serial number tag. It is made from 6061 T6 aluminum and lightened to make the e-Torque Box the lightest, yet strongest, EV Transmission on planet earth.